Scarlet fever is an infection that is caused by a bacteria called streptococcus. The disease is characterized by a sore throat, fever, and a sandpaper-like rash on reddened skin. It is primarily a childhood disease. If scarlet fever is untreated, serious complications such as rheumatic fever (a heart disease) or kidney inflammation (glomerulonephritis) can develop. Scarlet fever, also known as scarlatina, gets its name from the fact that the patient's skin, especially on the cheeks, is flushed. A sore throat and raised rash over much of the body are accompanied by fever and sluggishness (lethargy). The fever usually subsides within a few days and recovery is complete by two weeks. After the fever is gone, the skin on the face and body flakes; the skin on the palms of the hands and soles of the feet peels more dramatically. This disease primarily affects children ages two to ten. It is highly contagious and is spread by sneezing, coughing, or direct contact. The incubation period is three to five days, with symptoms usually beginning on the second day of the disease, and lasting from four to ten days. Early in the twentieth century, severe scarlet fever epidemics were common. Today, the disease is rare. Although this decline is due in part to the availability of antibiotics, that is not the entire reason since the decline began before the widespread use of antibiotics. One theory is that the strain of bacteria that causes scarlet fever has become weaker with time. Scarlet fever is caused by Group A streptococcal bacteria (S. pyogenes). Group A streptococci can be highly toxic microbes that can cause strep throat, wound or skin infections, pneumonia, and serious kidney infections, as well as scarlet fever. The Group A streptococci are; hemolytic bacteria, which means that the bacteria have the ability to lyse or break red blood cells. The strain of streptococcus that causes scarlet fever is slightly different from the strain that causes most strep throats. The scarlet fever strain of bacteria produces a toxin, called an erythrogenic toxin. This toxin is what causes the skin to flush. The main symptoms and signs of scarlet fever are fever, lethargy, sore throat, and a bumpy rash that blanches under pressure. The rash appears first on the upper chest and spreads to the neck, abdomen, legs, arms, and in folds of skin such as under the arm or groin. In scarlet fever, the skin around the mouth tends to be pale, while the cheeks are flushed. The patient usually has a "strawberry tongue," in which inflamed bumps on the tongue rise above a bright red coating. Finally, dark red lines (called Pastia's lines) may appear in the creases of skin folds. Cases of scarlet fever are usually diagnosed and treated by pediatricians or family medicine practitioners. The chief diagnostic signs of scarlet fever are the characteristic rash, which spares the palms and soles of the feet, and the presence of a strawberry tongue in children. Strawberry tongue is rarely seen in adults. The doctor will take note of the signs and symptoms to eliminate the possibility of other diseases. 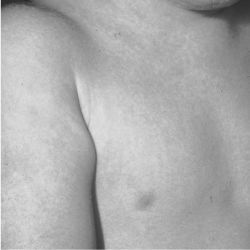 Scarlet fever can be distinguished from measles, a viral infection that is also associated with a fever and rash, by the quality of the rash, the presence of a sore throat in scarlet fever, and the absence of the severe eye inflammation and severe runny nose that usually accompany measles. The doctor will also distinguish between a strep throat, a viral infection of the throat, and scarlet fever. With a strep infection, the throat is sore and appears beefy and red. White spots appear on the tonsils. Lymph nodes under the jawline may swell and become tender. However, none of these symptoms are specific for strep throat and may also occur with a viral infection. Other signs are more characteristic of bacterial infections. For example, inflammation of the lymph nodes in the neck is typical in strep infections, but not viral infections. On the other hand, cough, laryngitis, and stuffy nose tend to be associated with viral infections rather than strep infections. The main feature that distinguishes scarlet fever from a mere strep throat is the presence of the sandpaper-red rash. Laboratory tests are needed to make a definitive diagnosis of a strep infection and to distinguish a strep throat from a viral sore throat. One test that can be performed is a blood cell count. Bacterial infections are associated with an elevated white blood cell count. In viral infections, the white blood cell count is generally below normal. A throat culture can distinguish between a strep infection and a viral infection. A throat swab from the infected person is brushed over a nutrient gel (a sheep blood agar plate) and incubated overnight to detect the presence of hemolytic bacteria. In a positive culture, a clear zone will appear in the gel surrounding the bacterium, indicating that a strep infection is present. Although scarlet fever will often clear up spontaneously within a few days, antibiotic treatment with either oral or injectable penicillin is usually recommended to reduce the severity of symptoms, prevent complications, and prevent spread to others. Antibiotic treatment will shorten the course of the illness in small children but may not do so in adolescents or adults. Nevertheless, treatment with antibiotics is important to prevent complications. Since penicillin injections are painful, oral penicillin may be preferable. If the patient is unable to tolerate penicillin, alternative antibiotics such as erythromycin or clindamycin may be used. However, the entire course of antibiotics, usually 10 days, will need to be followed for the therapy to be effective. Because symptoms subside quickly, there is a temptation to stop therapy prematurely. It is important to take all of the pills in order to kill the bacteria. Not completing the course of therapy increases the risk of developing rheumatic fever and kidney inflammation. If the patient is considered too unreliable to take all of the pills or is unable to take oral medication, daily injections of procaine penicillin can be given in the hip or thigh muscle. Procaine is an anesthetic that makes the injections less painful. Bed rest is not necessary, nor is isolation of the patient. Aspirin or Tylenol (acetaminophen) may be given for fever or relief of pain. If treated promptly with antibiotics, full recovery is expected. Once a patient has had scarlet fever, they develop immunity and cannot develop it again. Avoiding exposure to children who have the disease will help prevent the spread of scarlet fever. Bennett, J. Claude, and Fred Plum, editors. Cecil Textbook of Medicine. Philadelphia: W. B. Saunders Co., 1996.
an acute contagious childhood disease caused by Group A beta-hemolytic streptococci or occasionally other serotypes of beta-hemolytic streptococci. It usually affects the pharynx but may also affect the skin (wound and burn scarlet fever) or the birth canal (puerperal scarlet fever). The disease is most common in late winter and spring. Called also scarlatina. Scarlet fever is usually spread by droplet infection. Objects the infected person has used, such as clothes, dishes, or toys, may carry the streptococcus, but this mode of transmission is rare. Occasionally a widespread outbreak may be caused by milk or food that has been infected by a person carrying the streptococcus. It was formerly a very common and serious disease, but in recent decades the number and severity of cases have greatly decreased. Complications are much less common, largely as a result of the development and use of antibiotics. Symptoms. The incubation period is usually 2 to 5 days, although it may be as few as 1 or as many as 7 days. Symptoms vary a great deal. In some patients there is only sore throat and swelling of the lymph nodes of the neck. The tonsils may be covered by a patchy purulent discharge. The bright red rash from which the disease takes its name appears on the second day; it may be mild or widely spread, depending on the strain of the causative streptococcus. 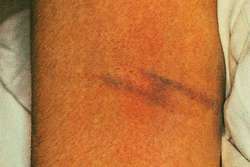 The rash is caused by a toxin produced by scarlatinal strains. There may be nausea and vomiting. The skin usually feels hot and dry, and there also may be headache and chills. In mild cases the temperature may rise to about 38°C (101°F) and in severe cases to 39 to 40°C (103 to 105°F). If there are no complications, the temperature will slowly return to normal. The rash may last only a few hours, but typically lasts two to three days before fading. There is superficial flaking of the skin over much of the involved area; this peeling is usually most pronounced on the palms and soles. In all, the active stage of the disease lasts about 7 days. Treatment. Antibiotics are administered, usually penicillin; this is continued for about 10 days to avoid relapse. Eating may be painful if the throat infection is severe, so that soft foods and a liquid diet may be necessary. Drinking of fluids should be encouraged. Complications. Among the possible complications are swelling of the lymph nodes of the neck, infection of the ears and sinuses, kidney disease, pneumonia, and rheumatic fever. Any of these complications may be serious. However, they are now rare in developed countries such as the United States and Canada. Prompt and adequate treatment greatly reduces the danger of complications. (skar'lă-tē'nă), Avoid the misspelling scarletina. An acute exanthematous disease, caused by infection with streptococcal organisms producing an erythrogenic toxin, marked by fever and other constitutional disturbances, and a generalized eruption of closely aggregated bright red points or small macules followed by desquamation in large scales, shreds, or sheets; mucous membrane of the mouth and fauces is usually also involved. An acute contagious disease caused by streptococcal bacteria, occurring predominantly among children and characterized by fever, sore throat, a rough, scarlet-red or dark rash, and often a whitish coating with red spots on the tongue. Also called scarlatina. an acute contagious disease of childhood caused by an erythrotoxin-producing strain of group A hemolytic Streptococcus. Also called scarlatina. observations Signs and symptoms appear 1 to 3 days after exposure to the agent, starting with an abrupt high fever, chills, tachycardia, nausea, vomiting, headache, abdominal pain, malaise, and a sore throat. The tonsils become enlarged, reddened, and covered with patchy exudate. The pharynx is red and edematous. The tongue is coated and white with red, swollen papillae (white strawberry tongue) until the white coat sloughs off about the fourth day, leaving a red strawberry tongue and red punctate lesions on the palate. A rapidly erupting rash appears 1 to 2 days after the onset of the sore throat. The rash displays as pinhead-size red lesions, which rapidly cover the body except for the face. The rash concentrates in the axial folds, on the neck, and in the groin and lasts 4 to 10 days. The face is flushed on the cheeks with a circumoral pallor. After a week, desquamation and peeling begin on the palms and soles. Diagnosis is made from clinical signs and a positive Schultz-Charlton reaction skin test or a positive throat culture. Complications include otitis media; sinusitis; peritonsillar abscess; and severe, disseminated toxic or septic disease (fulminating scarlet fever), which may cause septicemia and hepatic damage. interventions Treatment is aimed at eradicating the streptococcal infection through administration of antibiotics. Antipyretics are given for fever, and analgesics are given for sore throat pain. nursing considerations Nursing measures are largely supportive and include bed rest during the febrile phase; adequate fluids; gargles, throat lozenges, and throat washes for sore throat; and room humidification for comfort. Respiratory precautions should be instituted until 24 hours after initiation of antibiotics because of the edema in the pharynx and tonsils. Environmentally imposed restraints are used until 24 hours after the initiation of antibiotics to reduce the spread of this communicable disease. Distractive techniques with appropriate developmental activities are used to relieve pain and social isolation. Careful handwashing techniques are used to decrease risk of infection. Scarlatina Infectious disease A reaction to pharyngitis by Streptococcus group A–which produces an erythrogenic toxin, consisting of an oral enanthema–'raspberry' tongue, 'strawberry' tongue, generalized blanching erythema–sparing the palmoplantar region and mouth with circumoral pallor and linear petechiae–Pastia's lines. See Strep throat. An acute exanthematous disease, caused by infection with streptococcal organisms producing erythrogenic toxin, marked by fever and other constitutional disturbances, and a generalized eruption of closely aggregated points or small macules of a bright red color followed by desquamation; mucous membrane of the mouth and fauces is usually also involved. An infectious disease caused by STREPTOCOCCI (see STREPTOCOCCUS) acquired by inhaled droplets. Scarlet fever usually affects children but is now comparatively uncommon. It features sore throat, headache, fever and a characteristic rash caused by bacterial toxin. This starts as myriad tiny red spots spreading from the neck and upper chest to cover the whole body. The face is flushed but a pale zone is left around the mouth (circumoral pallor). The tongue has a white coating with red spots. As the rash fades there is skin peeling. Prompt treatment with penicillin is indicated to avoid the complications of streptococcal infection-RHEUMATIC FEVER or GLOMERULONEPHRITIS. an ACUTE, contagious disease in man, particularly of young children, caused by the bacterium Streptococcus pyogenes and characterized by inflammation of the pharynx, nose and mouth and a red skin rash. Acute exanthematous disease, caused by infection with streptococcal organisms producing an erythrogenic toxin, marked by fever and other constitutional disturbances; mucous membrane of mouth and fauces is usually also involved. Scarlet fever used to be a lot more common than it is now, but GPs are noticing more cases than in previous years at the moment. Children or adults diagnosed with scarlet fever are advised to stay at home until at least 24 hours after the start of antibiotic treatment to avoid spreading the infection to others. Scarlet fever, also called scarlatina, causes a blotchy, pink-red rash and mostly affects children under 10. In South Korea, the reporting criteria for scarlet fever were limited to confirmed case-patients until September 2012, after which the criteria expanded to include suspected case-patients. We've always seen cases of scarlet fever -- it's just the scale in the past has been much lower than the last few years. Scarlet fever is a syndrome characterised by exudative pharyngitis, fever and bright-red exanthem. CASES of scarlet fever are continuing to rise across the North East as the Victorian illness continues to make a comeback. SCARLET fever continues to rise across the North East as the Victorian illness makes a comeback. CASES of scarlet fever in Teesside have risen sharply, new official figures have revealed.